Mt Hobwee is one of the longer, but less challenging tracks in the Binna Burra section of Lamington National Park. 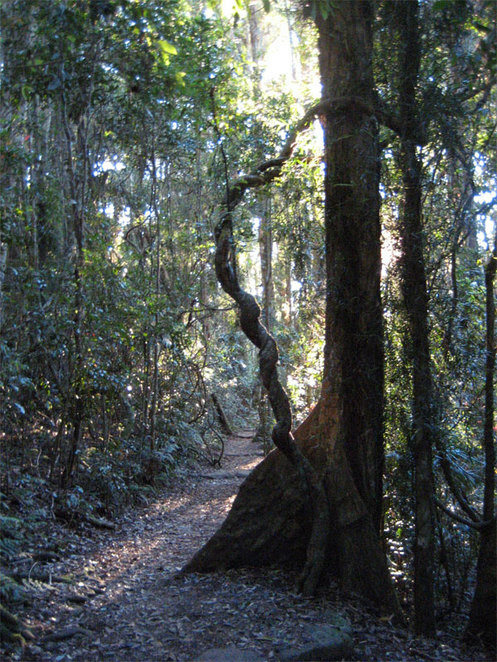 This circuit is ideal for people who are looking to try a longer hike in the Rainforest. This 18.2 km track starts off on the border track. It will follow this track for 5.4 km before you reach the start of the Mt Hobwee Circuit. The border track is a long well maintained track that is mostly flat that takes you through the heart of Lamington National Park's rainforest. Be aware that this track will take you all the way to O'Reilly's, so take a map with you and take care note of the turnoffs so that you don't end up walking too far. Along the track there is the Joalah Lookout that provides spectacular views of the Woggunbah Valley. These lookouts are basically where the track comes to the cliff's edge, so take care as you hike. The Mt Hobwee circuit is where it begins to head up hill, though the track never really gets steep. The top of Mt Hobwee is a pleasant place to stop for lunch but doesn't provide too much of a view as it is covered in trees. Most people to take some of the short side tracks to lookouts, including the Garragoolba and Araucaria lookout tracks and it is these lookouts that make the track worthwhile. You may even consider skipping going to the summit of Mt Hobwee, though it is probably the only place along the track that is suitable for a group to comfortably stop for lunch. The length of this track, including the ascent up Mt Hobwee ,means that you would want to be at least a medium level hiker before attempting this hike. If you are used to shorter hikes you legs will definitely be very sore by the end of the hike. You will also want to start early, especially in winter, to make sure you return back before dark. Overall this is a great long, but not strenuous, walk. The best thing is that it is rarely visited, so while you will see people on the border track, once you are on the Hobwee circuit chances are you will have the rainforest and views to yourself. At the end of a hike at Binna Burra it is always good to relax at the Binna Burra Mountain Lodge Cafe. Though be aware that it closes early on Sundays so all the more reason leave as early as possible.